Over a year ago I got all excited about getting sweaters from the thrift store, felting them, and making them into various things. 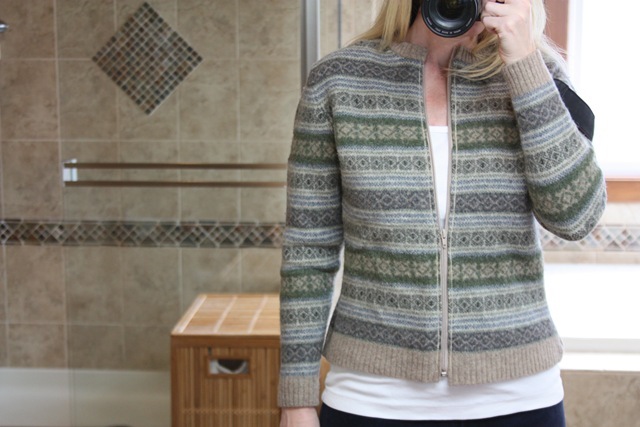 My partner in crime, blogless Chandria, and I bought over 20 sweaters, turned her laundry room in to a fuzzy wonderland, and plotted tons of projects. I did manage to complete a bag, but that was all until yesterday. 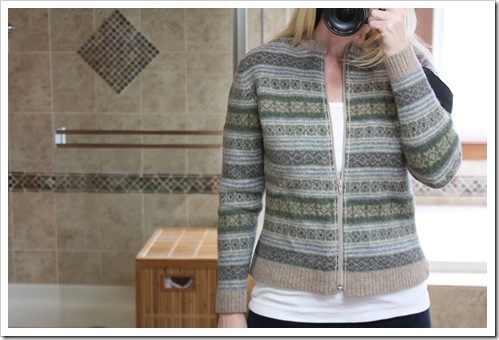 Last week I saw the Recycled Sweater Jacket on FlintKnits and thought.. "Ah Ha! I have sweaters. The sewing machine is out and I have to go to the fabric store anyway. It's only a tiny bit of sewing. I can do that." Amazingly enough, it all worked out just like I planned. The whole thing took less than 2 hours and other then trying to keep the zipper even and the stripes lined up (curses to stripes) it was even easy. I'm really pleased with the look and fit, and the fact that it cost less than $10 thrills me. 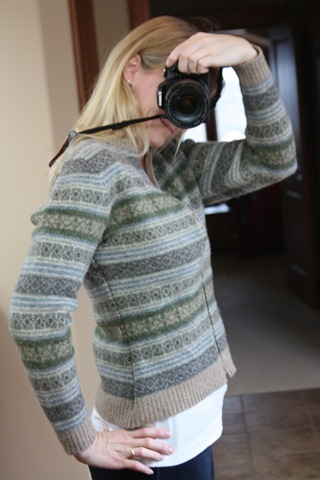 As you can see I didn't add the knit cuffs or collar. I thought the sweater looked good they way it was. 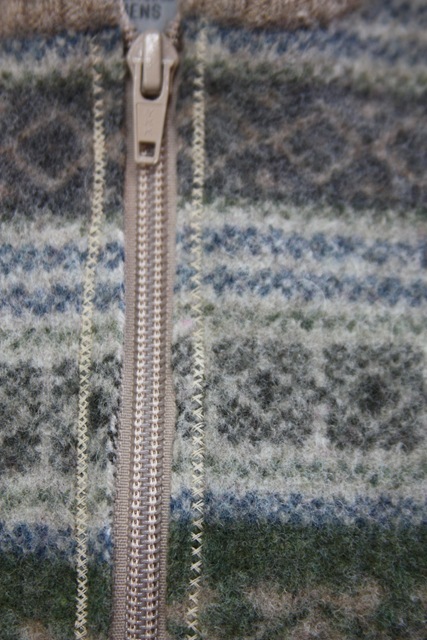 I did take in the sides and added an X stitch when I put in the zipper. 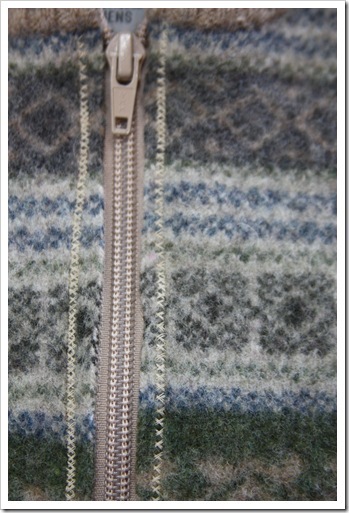 I think the fatter stitch makes it look a little more finished and gives the zipper extra strength. It's not perfect, but it's warm, cute and way more useful then when it was sitting in a drawer. Plus if I get tired of it, I can still cut it up for other stuff. 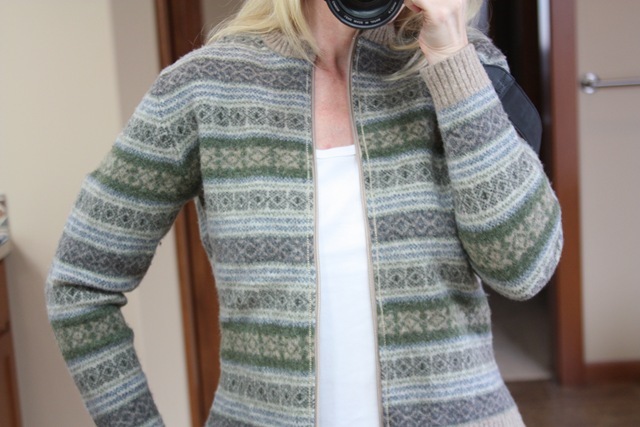 If you are thinking of giving the project a try yourself, be sure the sweater you choose is much larger than your normal size, lot of shrinkage because you have to felt it enough to cut it. 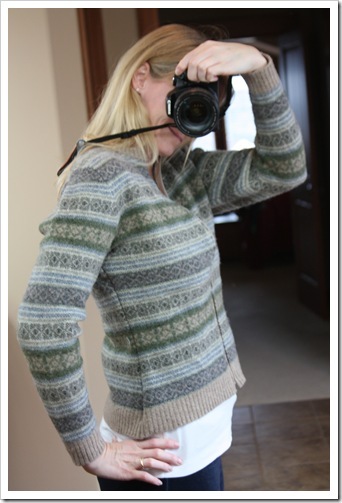 My sweaters was a man's large and I usually wear a woman's small or medium. 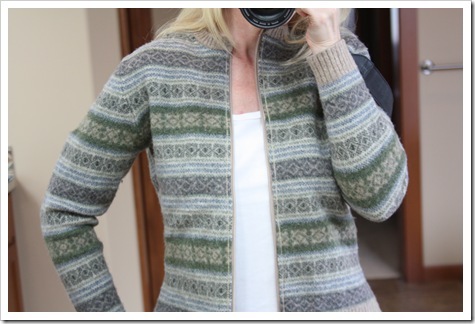 Give me another year and I might do something with the rest of the sweaters. I love what you did with the sweater. It looks really nice on you. Way to go! That is an amazing transformation. And it looks like it was custom made for you, which I guess it was, after some work! Inspiring. Love what you did. How did you do it? What is felting?